1978 Enzo Ferrari signed Gilles Villeneuve postcard. This official Ferrari factory issued postcard of F1 ace Gilles Villeneuve has been signed by "The Drake", Enzo Ferrari, himself in February 1978. In the typed text on the back, Enzo expresses his gratitude for the received birthday wishes and sends his regards in return. 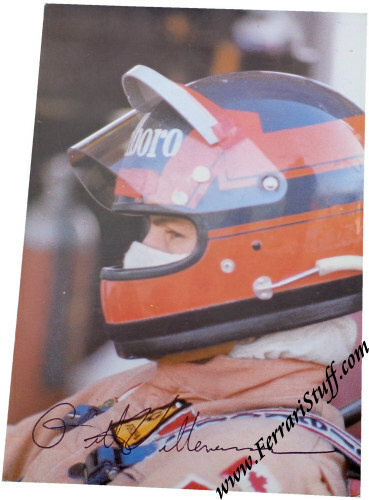 The card, in portrait format, shows a concentrated Gilles with his characteristic blue & red helmet on and the visor opened, apparently waiting in his car in the pits. The rear shows the above mentioned text, the Scuderia Ferrari logo and sponsors Agip, Magneti Marelli and Michelin. The card was printed by Grafiche Zanichelli in Sassuolo, right around the corner from Maranello. 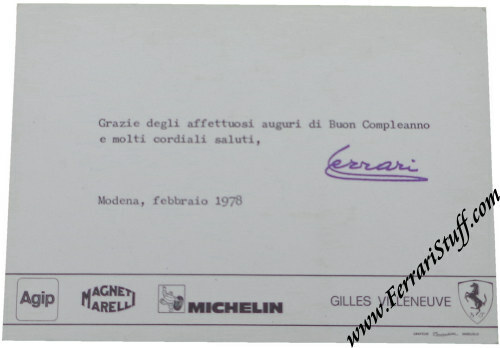 The Villeneuve signature on the front, the typed text on the back AND the Enzo Ferrari signature are ALL printed. Various sources confirm this and we have been able to compare it to other examples of this postcard which are EXACTLY the same. The postcard does not carry a print number but is listed by Michael Sauze in his book and he numbered it "78/03". A (very?) scarce Ferrari postcard with a desirable motif, interesting (printed!) text and Gilles is of course an all-time F1 hero!